Originally named “Save-the-Farm”, our organization was founded in October of 1984. Faced with the potential loss of Langhorne’s last remaining working farm to townhouse development, founding members met in each others’ living rooms and kitchens. Together, they devised an ambitious plan to acquire the property for permanent dedication as a town park. In June of 1986, the organization successfully negotiated the purchase of the farm from its owner. 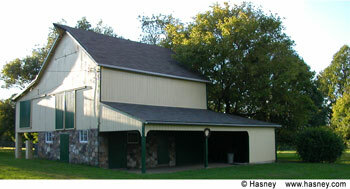 The park was named Langhorne Heritage Farm/ Julius Lojeski Acres. By securing grant funding from the Department of Community Affairs’ RIRA Program and raising funds through individual donations and fundraisers, LOSI was successful in paying off a $250,000 loan in 5 years … well ahead of schedule! The park was dedicated on April 22 (Earth Day), 1990. 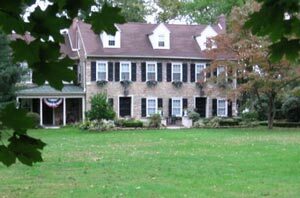 Once Langhorne Heritage Farm was acquired, Langhorne Borough appointed LOSI as its agent to maintain the 8-acre farm – including an historic farmhouse, large barn, a smaller barn, and several outbuildings. Over the years, LOSI has funded significant restoration and improvement of the farm. Today, Heritage Farm is a serene oasis in Lower Bucks County. It is home to community gardens, an artist community, and occasional concerts. Once a burial ground for American soldiers who died from wounds sustained in the battle of Trenton, the history of this small plot of land had been lost over the generations. In 1989, spurred by a plan to construct a housing development over this historic burial ground, Langhorne Open Space joined Langhorne Planning Commission and several members of Borough Council to move into action. Together, they convinced the Borough to have an archeological dig completed at the site before approving any development plans. In 1992, a noted archeologist was able to prove that the property had indeed been a burial site. During the winter of 1776, the remains of soldiers who died from battle injuries at a nearby building which served as a field hospital were taken to this site to be buried. 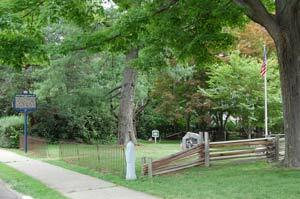 As part of an agreement with Langhorne Borough, the development deeded the burial site to the Borough in 1998. Today, the parcel is designated as a Pennsylvania Historical Site by the PA Historical and Museum Commission. The site was dedicated on November 11 (Veterans Day), 1999. This building was originally constructed in 1841 as a meetinghouse for the Orthodox Friends, which had split from the Society of Friends Meeting that is located on West Maple Avenue. When the Quakers reconciled, the property was sold in 1921 for use as a private residence. In the summer of 1997, alarmed by a developer’s plan to surround the Meetinghouse with duplexes, thereby eradicating its grandiose viewscape from Bellevue Avenue, Langhorne Open Space once again sprang into action. Within a year, LOSI negotiated an agreement with the developer to purchase a conservation easement to the expansive front yard for the Borough of Langhorne. LOSI raised $25,000 which was combined with grant funding from the Bucks County Open Space Program to purchase the easement. Today the historic stone structure remains a private home. Development is permanently prohibited on the large front lawn, and the viewscape fronting the meetinghouse is preserved for future generations. Shortly after completing its work on the Orthodox Quaker Meetinghouse project, Langhorne Open Space mobilized once again to preserve a 5+ acre parcel in the heart of the Borough. A developer had submitted plans to build 28 high-density townhouses on this parcel along the fragile Catawissa Creek. Beginning in 2000, LOSI mounted a 7-year effort to save this property from development. 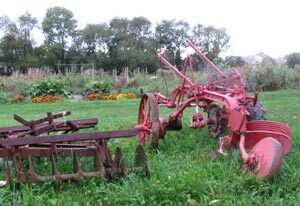 Interestingly, the land had been used several decades earlier as a pasture by the owners of what is now Langhorne Heritage Farm. Older neighbors recall cows being herded between the farm located on Green Street and the pasture located off of West Watson Avenue. In a sense, the preservation of the Catawissa parcel was seen as a conclusion of our effort to save the Farm twenty years earlier! The Catawissa Creek originates on this property. Natural springs feed the creek, which then courses northward through neighboring properties, eventually forming the ponds on the Middletown Country Club. The creek continues on and eventually empties into the Neshaminy Creek. The property is heavily wooded, and according to studies commissioned by LOSI, is home to over 70 species of birds, as well as a variety of other wildlife. In January of 2007, Langhorne Open Space succeeded in its vision to establish the property as a natural areas park. Through its grant-writing and fundraising efforts, LOSI enabled Langhorne Borough to purchase the property from the developer and establish it as a town park – preserved in perpetuity as open space. 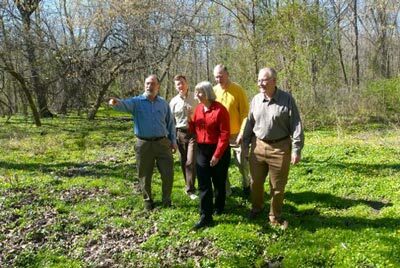 Catawissa Nature Preserve will continue to be home to a wide variety of birds and wildlife. We envision establishing a walking path through the property that could be used by educators, naturalists, and walkers. Earl Keen, was a veteran of WWII, and a paratrooper who jumped into various European sites, including Normandy on D-Day. He found great enjoyment in feeding local birds and in watching the local wildlife from his back porch. He was concerned, though, about what would happen when he no longer lived in his house at 136 West Marshall Avenue in Langhorne Borough. Would a developer buy the 2-acre field behind his house and try to build on it? Mr. Keen wanted to keep his property intact and to continue living in his home, which is located in the borough’s historic district. The idea troubled Mr. Keen, and when he was nearing 90 years of age, he contacted Langhorne Open Space to see if we could help with his dilemma. The solution that LOSI and Mr. Keen arrived at was for LOSI to purchase the development rights on the field behind his house. This kept the field in Mr. Keen’s hands, but also meant that the deed to the property would carry with it a conservation easement protecting his field from future development. Because the property continues under private ownership, it remains on the municipal property tax rolls. Until his death a few years later – Mr. Keen had the peace of mind of knowing that his beloved field and the wildlife that lived on it would be forever protected from development. Very few passersby realize that there is a meadow in the center of the block surrounded by Watson, Pine, Bellevue, and Marshall. It came into the borough’s hands when officials saved the lovely Victorian house from demolition on the Attleboro property and had it moved a block south and to the west side of Pine Street where it stands today. While the Victorian home remained in private hands, the open space directly behind it was owned by Langhorne Borough for over a decade. When Langhorne Borough decided to divest itself of the “Meadow”, Linda Manzo (the owner of the Victorian home) was interested in purchasing it. LOSI was asked to help determine how this might be accomplished while at the same time protecting the meadow permanently from development. Through negotiations with both the borough and Ms. Manzo, LOSI helped make the deal possible by purchasing an open space easement on the meadow at the same time the parcel was purchased by Ms. Manzo to be combined with her lot. Because of the conservation easement, the Meadow is safe from development — a serene backyard viewscape for all those who live on the four surrounding streets.